St. Johann‘s furnishing house is equipping itself for the future – and thus setting new standards in the realisation of individual dream homes throughout Austria. 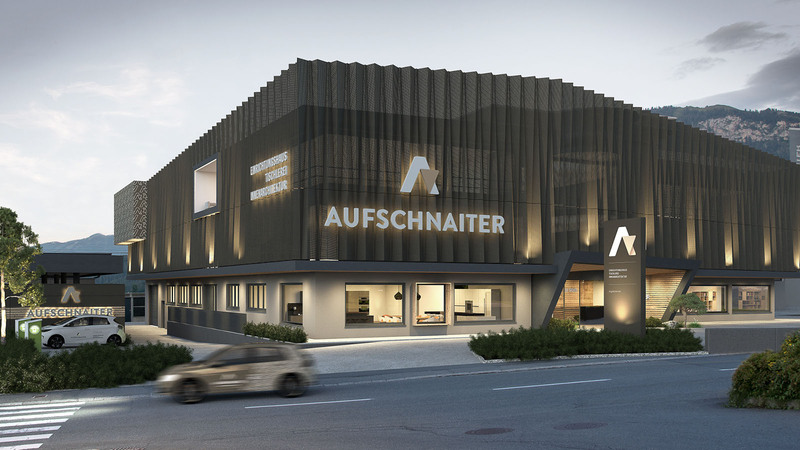 As a family business with a success story that spans over 50 years, Aufschnaiter has a firmly established foothold in the Kitzbühel region. The brand has always stood for first class craftsmanship, strong regional affinity, keen awareness of current trends, as well as exclusive design and living culture. Values that are not going to change in the future. Other kinds of change, however, are in the air: after pioneering conversion work, the new Aufschnaiter building takes shopping experiences to the next level as from January 2017. In addition to new office space, showrooms and exhibition areas, a separate department for interior architecture is being created to devote more space for interior architecture, in the truest sense of the words. Customers benefit, of course, from the in-house carpentry workshop, where customised pieces are made to measure. Oversized presentation tables, cupboards full of fabric patterns and accessories, as well as a competent consulting team await in the new Aufschnaiter textile department, where the focus is on personal advice – just like in a fashion boutique. The highly modern building facade embodies Aufschnaiter‘s orientation towards the future. In addition to the new company quarters, the brand image has been completely revamped with a new and meaningful slogan.